Critics of Herodotus have generally shown an unease in the face of the religious passages of the Histories, a sense that he 'lets himself down' by delving into matters irrelevant to the proper purpose of history. They have tended consequently to latch on to isolated instances of scepticism in an attempt to vindicate Herodotus from imagined charges of obscurantism. Historians of Greek religion, on the other hand, by their concentration on ritual as the central feature of Greek religious experience, have often neglected the value of literary sources as evidence of religious belief; indeed the term belief has become something of a dirty word. 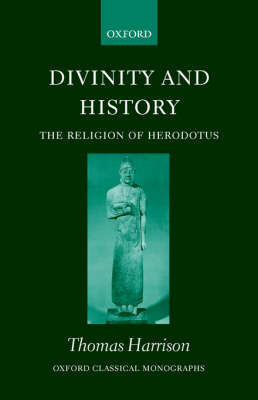 In this book, the first full-length study of the subject in English, Dr Harrison not only places Herodotus' religious beliefs at the centre of his conception of history, but by seeing instances of scepticism and of belief in relation to one another redresses the recent emphasis on the centrality of ritual, and paints a picture of Greek religion as a means for the explanation of events.